Greetings again from the darkness. Not wanting to watch another movie related to the Holocaust is understandable. Why should you purposefully agree to experience the misery and unfathomable horror that occurred? The simple answer is that we should never forget one of the darkest and inexcusable periods in human history. 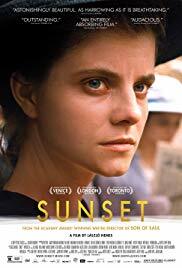 Director Laszlo Nemes delivers a new approach … a different viewpoint … and it grabs us and doesn’t let go. The startling opening is a long-tracking shot featuring Saul Auslander (played by Geza Rohrig) and his duties as part of the Sonderkommando unit at 1944 Auschwitz-Birkenau concentration camp. The red X on his jacket relegates Saul to corralling the next round of Jews into the gas chamber and then cleaning up for the next group. The reward of this position means the delay of his own inevitable death. It’s a closer, more intimate look at a process that we have not prevented ourselves to think much on. What we soon realize is that dialogue is minimal and most of what we see is as if we were standing right beside or just behind Saul. The shallow focus means much in our sight line is blurred, and we are exceptionally dependent on the sound – what we hear often conveys more of the message than what we see. Cinematographer Matyas Erdely never allows our eyes to drift … he shows us only so much, forcing our brain to process and interpret so many more clues. The horrific proceedings may be blurred, but it’s a devastating experience nonetheless. Saul’s stoic face masks his true emotions and disgust, and prevents him from drawing any unwanted attention. 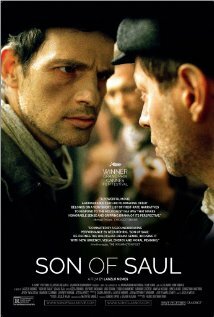 Saul’s dependability as a Sonderkommando changes in the blink of an eye – he sees the body of a young boy whom he claims is his own son. He becomes obsessed with finding a Rabbi to allow for a proper burial for the boy. It seems clear that this mission is a chance to break from his soul-crushing duties and grab a bit of redemption before it’s too late. Unfortunately, the timing of this mission conflicts with a planned prisoner uprising … adding more complexity to a nearly impossible quest. This is the feature film debut of director Laszlo Nemes, who also co-wrote the story with Clara Royer. Some of the specifics are drawn from “Voices from Beneath the Ashes” (edited by Ber Mark) and “Auschwitz: A Doctor’s Eyewitness Account” by Miklos Nyiszli. It’s a fearless vision for Holocaust storytelling with many open-ended issues (we don’t always know identities and positions of those we see) and few conclusions provided. But then we all know the ultimate conclusion, and this look may be the most devastatingly intimate look we have ever had. It’s not a movie that allows you to kick back on the sofa and simultaneously catch up with Facebook. It demands and deserves attention and patience. Nothing here is designed to allow us a “hands off” view from a safe distance. In fact, the lack of traditional story structure and dialogue direction forces us to face the ugliest reality through a different perspective than we’ve ever considered. Powerful stuff.